Besides the 92 elements that occur naturally, scientists were able to create 20 additional chemical elements, six of which were discovered at the GSI Helmholtz Centre for Heavy Ion Research in Darmstadt. These new elements were produced artificially with particle accelerators and are all very short-lived: they decay in a matter of a split second. However, scientists predict the existence of even heavier elements with an extreme longevity, leaving them to only decay after years. These elements form an island of stability. 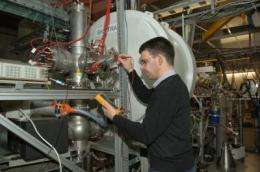 Scientists at the GSI Helmholtz Centre for Heavy Ion Research in Darmstadt, Germany, have developed and applied a measuring apparatus that might allow them to discover such long-lived elements, reports the renowned scientific journal Nature. An international team of scientists headed by Michael Block was able to trap atoms of the element 102, nobelium, in an ion trap. This is the first time in history that a so-called super heavy element had been trapped. Trapping the element allowed the research team to measure the atomic mass of Nobelium with unprecedented accuracy. The atomic mass is one of the most essential characteristics of an atom. It is used to calculate the atom's binding energy, which is what keeps the atom together. The atom's binding energy determines the stability of an atom. With the help of the new measuring apparatus, scientists will be able to identify long-lived elements on the so called islands of stability that can no longer be assigned by their radioactive decay . The island of stability is predicted to be located in the vicinity of the elements 114 to 120. "Precisely measuring the mass of nobelium with our Shiptrap device was a successful first step. Now, our goal is to improve the measuring apparatus so that we can extend our method to heavier and heavier elements and, one day, may reach the island of stability", says Michael Block, head of the research team at the GSI Helmholtz Centre. 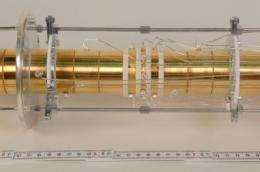 For their measurements, Michael Block and his team built a highly complex apparatus, the ion trap "Shiptrap", and combined it with "Ship", the velocity filter which was already used in the discovery of six short-lived elements at GSI. To produce nobelium, the research team used the GSI accelerator to fire calcium ions onto a lead foil. With the help of Ship, they then separated the freshly produced nobelium from the projectile atoms. Inside the Shiptrap apparatus, the nobelium was first decelerated in a gas-filled cell, then the slow ions were trapped in a so-called Penning trap. Too bad that the so call island of stability requires such neutron rich nuclei. Known techniques for producing heavier atoms can produce atoms of 116 protons (the center of the stability island), but the isotopes produced are very neutron poor. This is because we produce heavier nuclei by smashing together 2 lighter nuclei, and the neutron/proton ratio for stable light nuclei is usually lower than any stable heavier ones. So while measuring these beasts is very well and good, and a nice step, actually producing them is the really hard part.